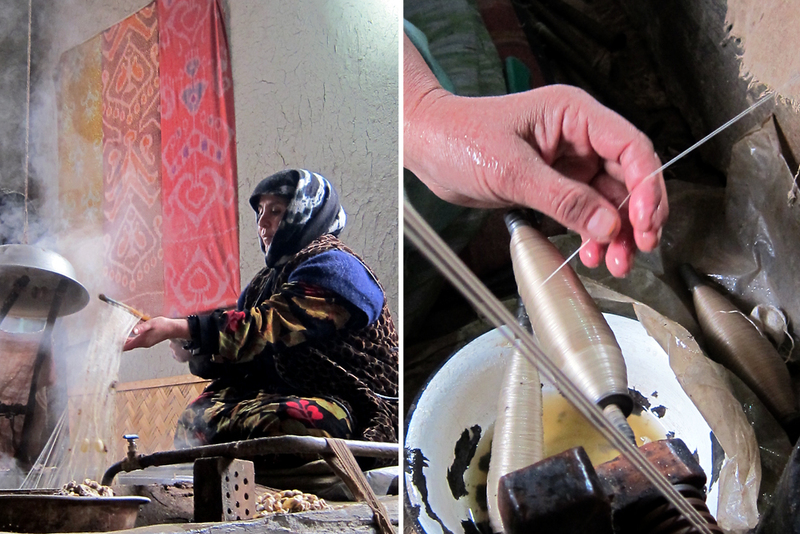 Maryam Madaminova winds silk threads (right) while another worker ties knots to dye the silk in the traditional ikat technique. 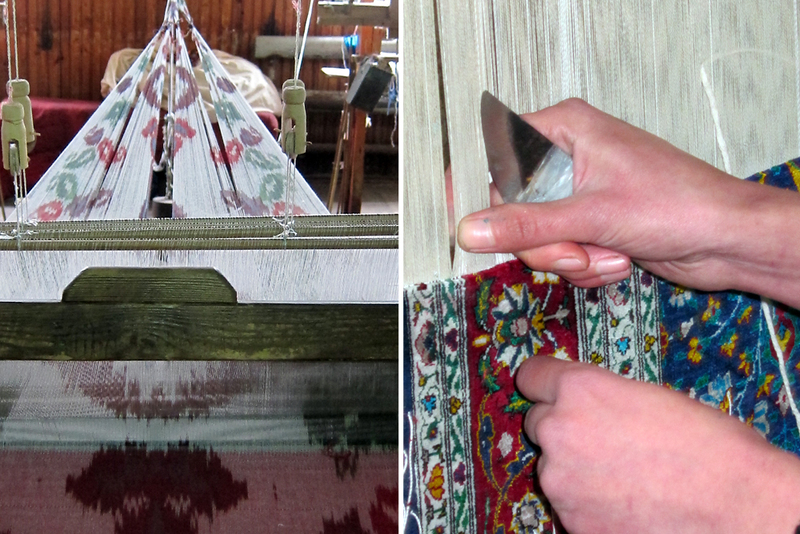 Silk fabric is made on a textile loom (left) and a worker weaves a carpet at the Yodgorlik silk factory in Margilan. 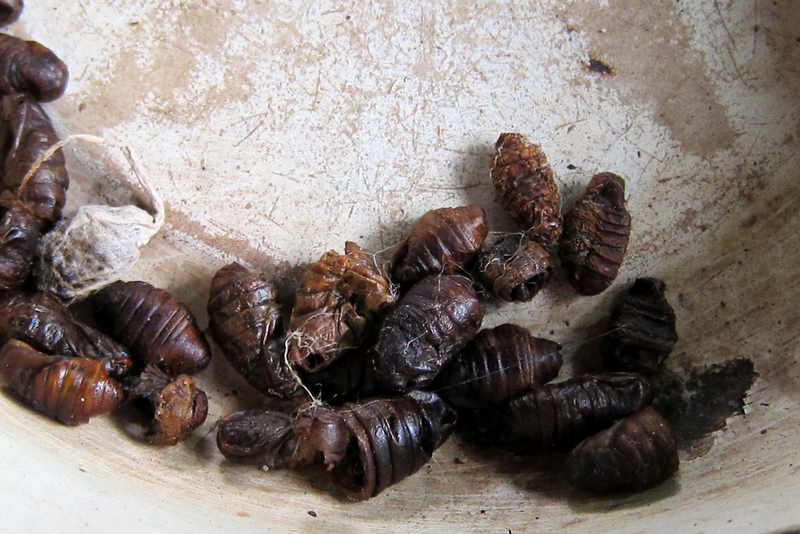 Once the silk cocoons have been removed, the worm larvae are discarded. Nigora Akhonova unravels the silk from cocoons (left) that is then wound onto spools at the Yodgorlik factory. 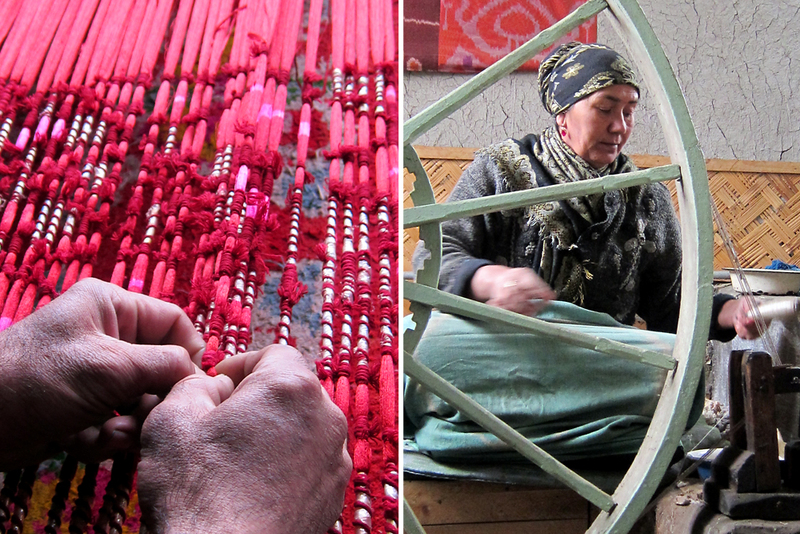 Dildora Katabekova weaves a carpet (left) and Uzbekistan’s legendary ikat silk threads are bundled for making into fabric. A trader sells silk at the Kumtepa market, where children's silk outfits are sold along with bulk fabric. 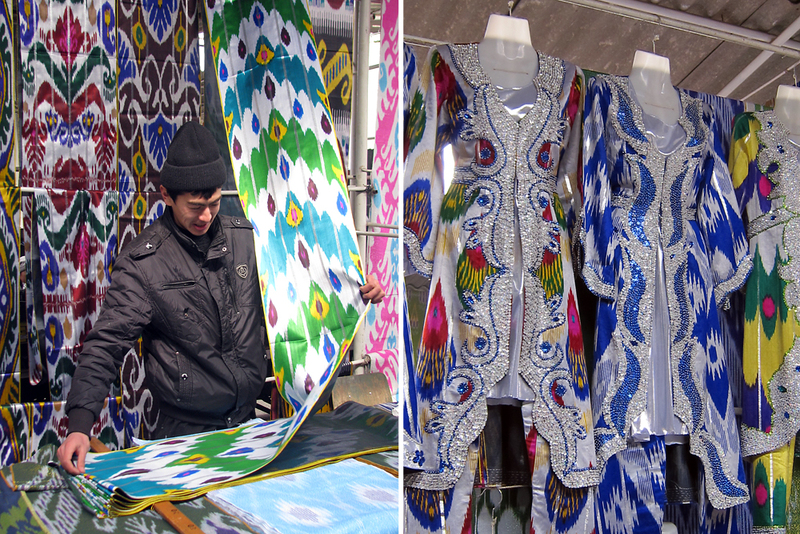 Shoppers browse silk products at the market in Kumtepa in the Fergana Valley. A trader measures silk at the Kumtepa market, where ornately designed women's silk dresses are available as well. 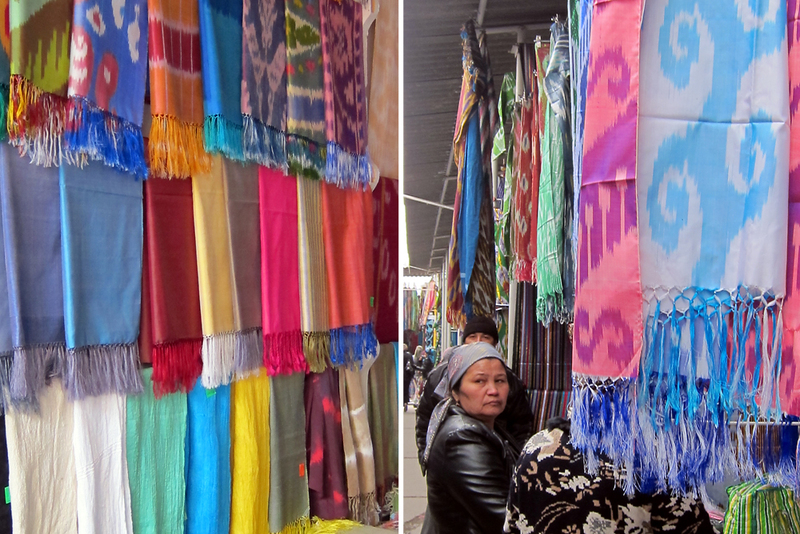 Silk scarves are on sale at the Yodgorlik silk factory (left), while the Kumtepa market features a larger variety of silk items. 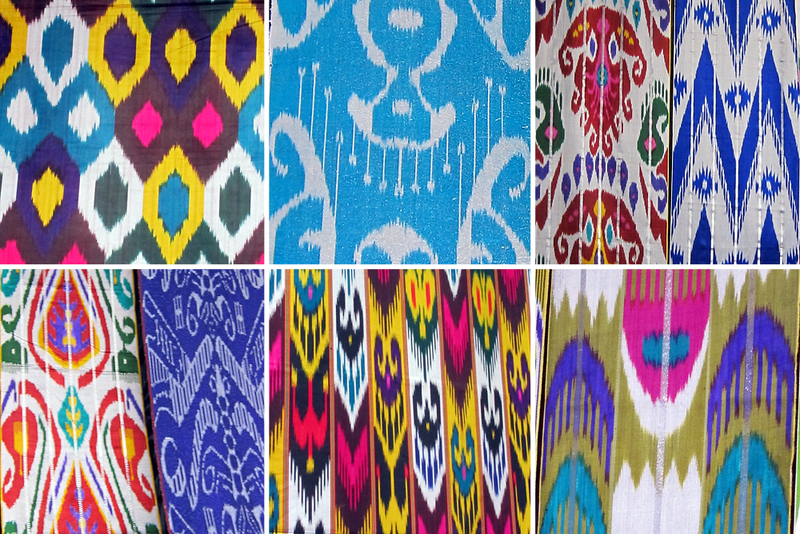 Patterns of colored silk fabric available at the Kumtepa market range from psychedelic to two-toned. 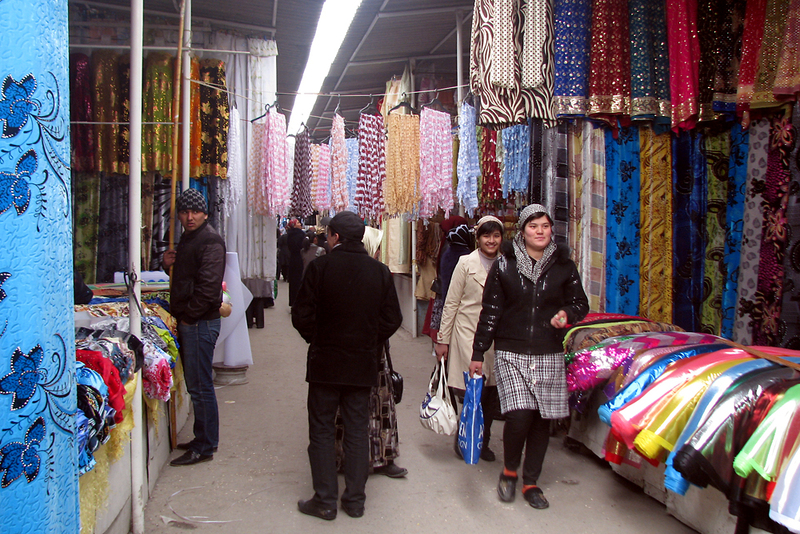 Silk traders wait for customers at the Kumtepa market (left) and finished carpets are on sale at the Yodgorlik silk factory. 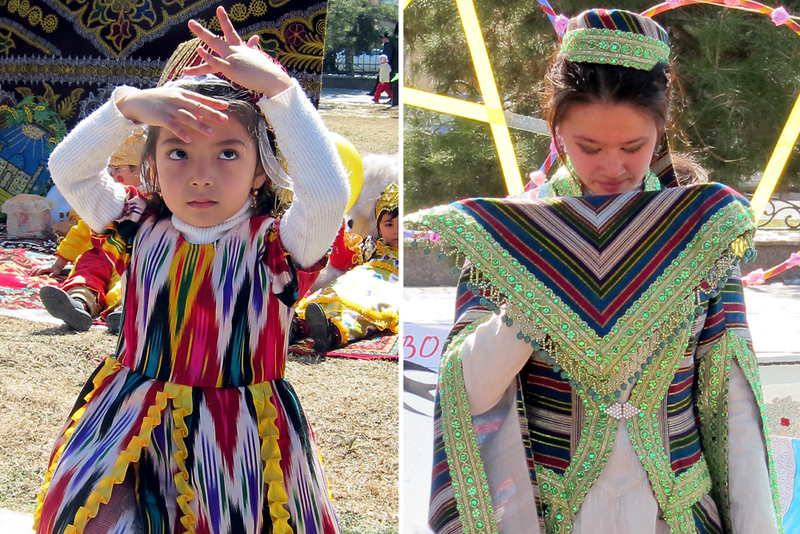 A young girl dances in traditional ikat silk (left) and a woman displays another silk costume design during the Novruz festival. 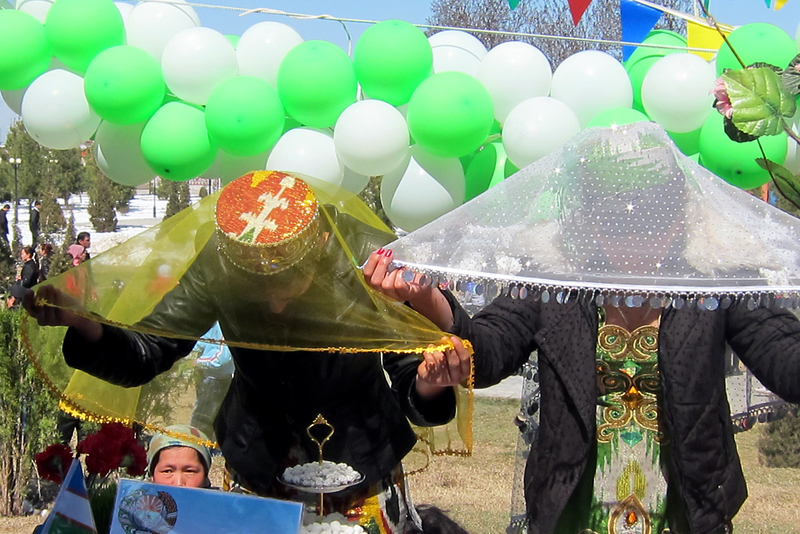 Girls display silk hats as they bow to visitors in Samarkand during the Novruz festival. 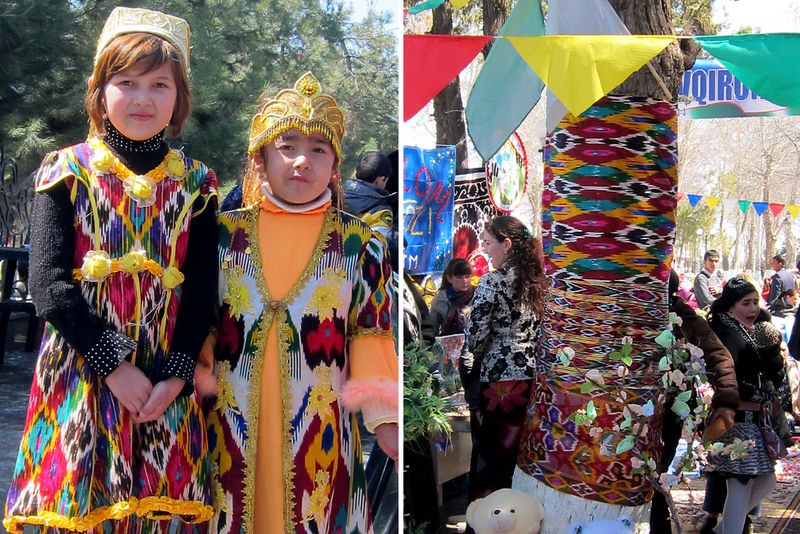 Girls show their traditional silk costumes and a tree is decorated with ikat silk fabrics (right) for the Novruz celebrations. 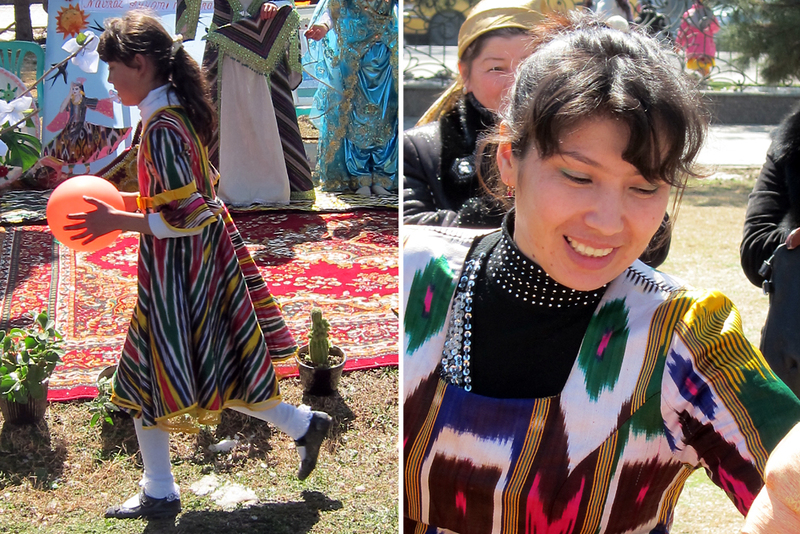 A girl dressed in silk plays with a balloon and a women dressed in silk dances during Novruz in Samarkand. In a workshop in the heart of Uzbekistan’s Ferghana Valley, Nigora Akhonova is seated over a steaming vat of silk cocoons. With measured movements she stirs the pot and pulls out some of the off-white, almond-sized cocoons using a stick to hook the gossamer threads spilling out of them. Slowly unraveling the strands, she feeds them across to Maryam Madaminova, who winds them onto a spindle. Akhonova has been doing this for three decades, but sericulture – the rearing of silkworms and production of silk – has been practiced in the Ferghana Valley for well over a millennium. Here at the Yodgorlik silk factory in the town of Margilan, the ancient art is thriving. The silk is painstakingly produced by women like these, before being dyed and woven into bright textiles or luxurious carpets. The whole process is done by hand. This is a labor of love, from the top down. Yodgorlik is owned by Azamhon Abdullayev, who joined the factory 31 years ago as an economist, but fell in love with the silk business and moved into production. Silk runs in Abdullayev’s family: His grandfather was a silk and cotton entrepreneur who was shot by the Soviets in 1937 at the height of Stalin’s political repressions. The proud owner of Yodgorlik (which means “souvenir” in Uzbek) became the factory director in 1988, steered the business through difficult economic times as the Soviet Union collapsed three years later, and finally bought it outright when it was privatized in 2000. The town of Margilan is famous as a sericulture center, but silk is made across Uzbekistan, from the Ferghana Valley in the east to Khorezm in the west. The country is the world’s third largest silk producer after China and India, accounting for around 5 percent of global output. Like the cotton industry, the state has a monopoly over silk production, but across Uzbekistan small private farms and local households are drafted every year to help with the harvest. State collective farms temporarily hand over batches of larvae to nurture—a tough job that involves keeping the budding creatures warm, fed and safe from predators as they grow into silkworms. The pupae are voracious eaters, munching on a diet of mulberry leaves at least five times a day as they swell to 10,000 times their original size. When they are about a month old the silkworms spin their cocoons, formed of a single thread of silk a kilometer long. After the silkworms have done their job, the cocoons are returned to the collective farms to be sold to factories and small workshops. Yodgorlik purchases about 20 tons of cocoons a year. Then begins the laborious process of making the silk by hand. The worms are boiled alive inside their cocoons, with Akhonova unraveling the thread and Madaminova winding it onto spindles. These two cheerful women represent the older generation of workers at Yodgorlik, but the factory is also teaching its arts to a younger generation. Eighteen-year-old Bobur Nomonov, a dyer, demonstrates how Uzbekistan’s legendary ikat silks are made, grabbing a bundle of silk threads stretched over a rack and, with dexterous fingers, tying a knot. Ikat is similar to tie-dyeing, but the dyes are painted onto the threads around these knots before the fabric is woven, rather than after. These days Yodgorlik is expanding its use of natural dyes, with Dieter Kaiser, a visiting master dyer from Germany, training staff in using substances such as madder root, cochineal and indigo. 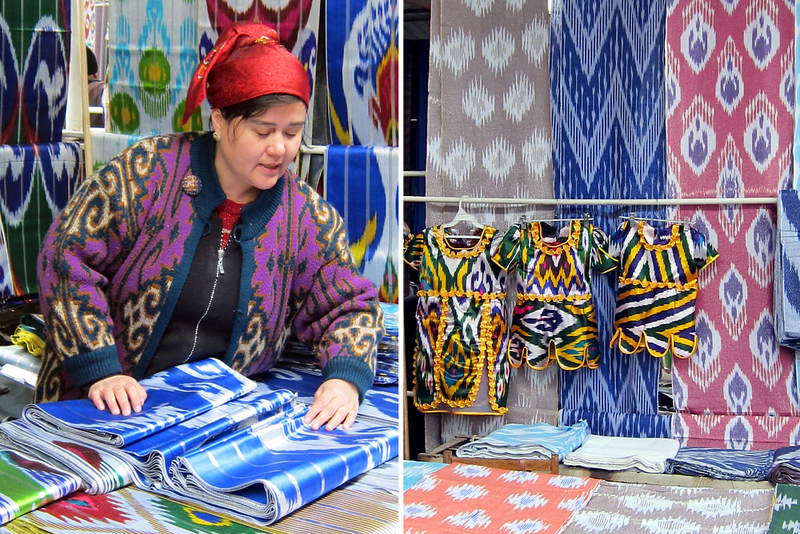 Abdullayev and his team pride themselves on keeping alive traditions like ikat and other hallmark textiles such as khan atlas—so named because it is considered the most regal of silks. 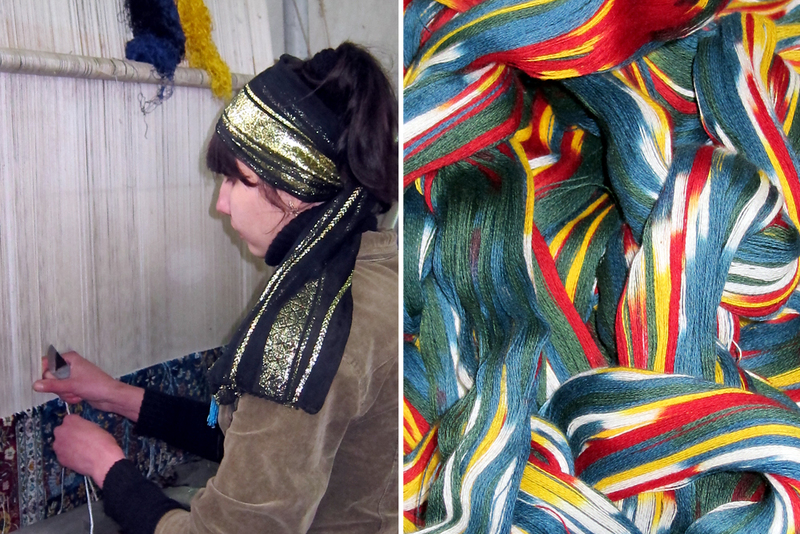 Carpet weaving is another skill the factory is helping to pass down: Twenty-five-year-old Dildora Katabekova kneels in front of a loom, bringing to life a colorful design with her nimble fingers. It takes seven or eight months to weave a carpet. 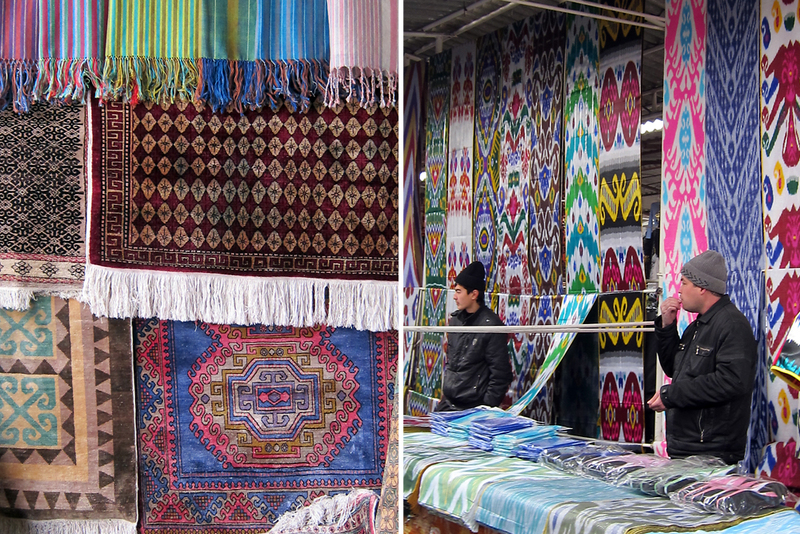 The carpets, scarves and fabrics made here are mostly sold to foreign tourists. At the market in the nearby village of Kumtepa, that fondness for silk is evident. Psychedelic silks flutter above the stalls and women finger them lovingly, debating which pattern will suit them best. It seems that silk never goes out of fashion.